Coming into Season 6 of HBO's Game of Thrones, fans already knew that several characters who haven't been seen in Westeros for quite some time, will be making their triumphant return. The most notable of these missing characters is Isaac Hempstead-Wright's Bran Stark, who will be featured in next week's episode "Home", airing Sunday, May 1 at 9 PM ET. Today we have new photos from the episode, which also offer first looks at two more returning characters, Ellie Kendrick's Meera Reed and Gemma Whelan's Yara Greyjoy. We last saw Meera at the end of Season 4, when she reached the weirwood tree with Bran and Hodor (Kristian Nairn). Before Season 5 debuted, it was revealed that Bran, Hodor and Meera wouldn't be featured at all that season, since their story had caught up to George R.R. Martin's novels. Bran has spent his time up north training with the Three-Eyed Raven (Max Von Sydow) to hone his greensight, which allows him to see the past, present and future. We'll have to wait and see what the HBO fantasy drama has planned for Bran, Meera and the fan-favorite Hodor now that they have returned. 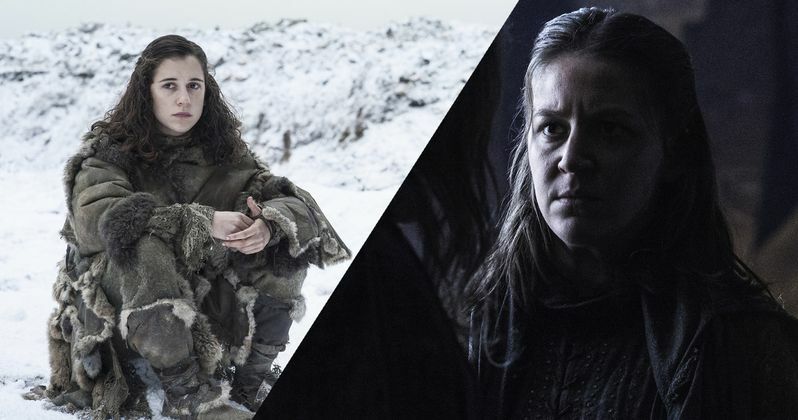 Gemma Whelan's Yara Greyjoy also hasn't been seen since Season 4, but it isn't terribly surprising that she's returning, especially given some of the casting rumors that have swirled around the show over the past year. One of the more prominent rumors involved the casting of Pilou Asbaek, who has long been rumored to be playing Euron Greyjoy, the uncle of both Theon (Alfie Allen) and Yara Greyjoy. We also learned when the "Home" synopsis was released this week that Theon and Yara's father, Balon Greyjoy (Patrick Malahide) will also return, who will be entertaining "other proposals." The Home synopsis also teased that Bran trains with the Three-Eyed Raven, while, in King's Landing, Jaime (Nikolaj Coster-Waldau) advises Tommen (Dean-Charles Chapman). In Meereen, Tyrion (Peter Dinklage) demands good news, but has to make his own. At Castle Black, the Night's Watch stands behind Thorne (Owen Teale), while, in Winterfell, Ramsay Bolton (Iwan Rheon) proposes a plan, and Balon Greyjoy (Patrick Malahide) entertains other proposals. Hopefully we'll get to see some new footage from "Home" before the episode debuts on HBO this coming Sunday. The photos give us a closer look at Owen Teale's Aliser Thorne, who has taken over as Lord Commander of the Night's Watch, after killing Jon Snow in last year's heartbreaking Season 5 finale. We also get a better look at Ben Crompton's Dolorous Edd, one of the Night's Watch members who remains faithful to Jon Snow, along with sneak peeks at Bran Stark, Lord Varys (Conleth Hill) and Missandei (Nathalie Emmanuel). Take a look at these images below, and stay tuned for more on this week's episode of Game of Thrones.